As I mentioned in my last blog, we have tried to spend more time at anchor on this trip to the Bras D'Or, and we have managed to visit a few spots. The Bras D'Or Lakes are brimming with coves, harbours, and inlets where you can easily find some seclusion and protection from almost any wind direction. We have only scratched the surface of the great locations over here, and we have plenty more destinations on our list of future visits. Our thoughts this year was to alternate between anchorages and marinas. While we are quite comfortable at anchorage in Obsession, the lack of refrigeration means we have to get more ice for the icebox every other day. Also, Obsession doesn't have a particularly large water tank. We can probably get by for three days or so with the water we carry, but then it gets down and we're more comfortable stopping and refilling it. After all, we need our daily shower! Cape George is a popular spot during the day - which in our experience means you can expect about a half dozen boats on a nice day. Although we didn't anchor overnight, we did spend an afternoon here. As in most areas in the Lakes, the water is deep enough to allow you to anchor relatively close to the shore. This is a big difference from PEI, where the sand bars keep you out quite a distance. This cove is at the Lake end of St Peters Inlet, just before entering the wider part of the Lakes. For Obsession, it is just a bit over an hour for us to motor here from St Peters Marina, so it's a perfect spot to take family for a day. This is the second year that we anchored in the Crammond Islands. These two islands lie close to each other, and are just three miles north of Dundee Marina. To get to the mid-island anchorage area, you pass through the channel, which then opens up into a circular, well-sheltered area. We spent a night anchored in Little Harbour this year for the first time. I had been wanting to check out this place since I first heard about it, and we finally made it this year. This has quickly become one of our favourite spots. You almost have to be right on top of the entrance before you can even see it. The entrance to the harbour is very narrow - probably less than 100 feet across in places. However, it is quite deep and there is no problem getting in with our 6 foot keel. Once through, it opens out into a circular bay with plenty of room for dozens of boats. It is extremely quiet and isolated. There were three other boats in the harbour while we were there, at least two of which were unoccupied (we couldn't tell if there was anyone on the third boat or not). We spent a wonderful afternoon and night at this spot, totally set apart from the rest of the world. Orangedale is a bit off the main track for the Bras D'Or Lakes, but we wanted to explore this section. The wind was not entirely cooperative, so we had to motor for about two hours through the sometimes narrow passages to get to Orangedale. Once there, we buzzed by the community (which is quite small). Although the cruising guides say that there is enough water at the end of the dock for us, we didn't actually stop at the town. We anchored in MacDonald's Cove next to the town, again with no one else around. On the north side of Iona, Maskell's Harbour is midway from the Barra Strait Bridge to Baddeck. Since it is only few miles from Baddeck, this is a very popular day trip. We anchored for the night, along with a half dozen other boats. It is large enough that we had a whole section of the harbour to ourselves, and none of the boats interfered with each other. There is a small peninsula that extends out from land to the midpoint of the harbour, and most boats like to tuck in behind this bar. When we arrived, there were already a few boats in there, so we anchored on the other side, near the beach. Our final anchorage on this trip was in Deep Cove, west of Baddeck. We had this area to ourselves. It is smaller than most of the other places we had stayed in, with only swing room for a handful of boats. Again, the harbour was quiet and isolated, with no one else in sight. It's always surprising that the Bras D'Or aren't more crowded with cruising boats. For a relatively small area, there are so many quiet, interesting, and scenic spots to check out. There are enough marinas and facilities for regular resupply, and hundreds of isloated spots to explore. Most of the time, we had an entire anchorage or harbour to ourselves. There would be only one or two houses even in sight, and often no roads anywhere nearby. This was our third visit to the Bras D'Or Lakes with Obsession, and it won't be the last. This is our third trip to the Bras D'Or lakes in Obsession, and we have made an effort to spend more time at anchor than our previous trips. However, we still spend some time in marinas. In fact, we tend to spend more nights in marinas than at anchor, partly because the lack of refrigeration on our boat means that we have to replenish our supply of ice every day in the icebox. That means making landfall anyway, so we use the time to resupply ourselves. Also, because we usually cannot fully leave our work behind, we need to have internet access every so often. Finally, even though we have a shower in the head, it is small and cramped, so we appreciate the luxury of having a full sized shower every couple of days. Port Hawkesbury marina is not on the Bras D'Or lakes, but it is often our first stop on our way home, or our last stop before hitting the lakes. This year, they have opened a large new two-storey building for the marina. They have a shower in each of the men's and women's washrooms, as well as another washroom/shower in the building next door. Most of the space in the building is taken up by a lounge. The facility is licenced, and drinks are available. In the Bras D'Or lakes, there are three principal marinas - St Peter's, Baddeck, and Dundee. Of the three, we have spent the most time in St Peter's (mainly because my family is nearby) and the least in Dundee. St Peter's is one of the best marinas that we've visited. There are plenty of berths. The only time we've ever seen them full was last year when a hurricane was threatening and all the local boaters wanted a spot for the night. The staff is always ready to catch your lines when you arrive, and they have plenty of facilities. There are five washroom/showers, a kitchen and television areas, and barbecues for the boaters. It's also a short walk to the town, where most services are available. The one service that is not available in the town is a good marine supply shop. We have spent quite a few nights at the Baddeck marine. Like St Peter's, they are quick to help you on the docks and the marina is a short walk from the town's services. However, they have limited slips (although there are plenty of moorings) and they have been full at times when we were looking for a spot. There are a couple of showers each for men and women, but no relaxation area for boaters. However, they have the advantage of a full marine supply and repair shop on site. This year, they helped me clean a bad electrical connection on board Obsession. We have not spent many nights at Dundee. There are two main disadvantages to this location. First, there are no services in Dundee outside the marina. Secondly, cell phone service is spotty at best. Because we also own a summer tourist-related business, we need to keep in touch when we're on the water at this time of year, so being in a location where we can't be reached is a big disadvantage. There is one other location on the lakes which we stopped into this summer. The Barra Strait marina is at the foot of the Barra Strait bridge in Iona. However, this facility makes use of an old ferry dock, which has seen better days. There is a marina building with washrooms, showers, and laundry facilities. The location is also exposed to the winds from many directions. We briefly considered spending the night, but the south-west wind was uncomfortable, so we stopped only long enough to buy ice from the convenience store next door, then found an anchorage for the night. So, we are off on another sailing trip. This time to the Bras D'Or Lakes in Cape Breton, Nova Scotia. Arguably one of the nicest cruising grounds on the east coast, a trip to the Bras D'or Lakes has become an annual pilgrimage for us. With much of Jay's family in Cape Breton, it is fun not only because of the great sailing, and protected anchorages, but also provides us a great opportunity to visit family and friends. We stayed aboard in Montague on our first night, provisioning the boat and dealing with last minute details. The next morning, we left around 10am. A bit of a late start, but we were only planning a short passage to Ballantyne's Cove, Nova Scotia, just across the Northumberland Strait. You can make Port Hawkesbury in Cape Breton in about 12 hours of sailing, but we were in no hurry and decided to make Ballantyne's Cove (a 6 to 7 hour sail) our first stop on the trip. The day was mostly sunny, warm and calm as we set out. As we motored up the Montague River and out of Cardigan Bay, we took advantage of the calm seas to bake some muffins and make coffee. As we left Panmure Island behind us about 12:30, we spotted a seal, poking his head up out of the water as we passed. I'd like to think he was wishing us a safe passage, but likely he was more curious about the noise of our engine. 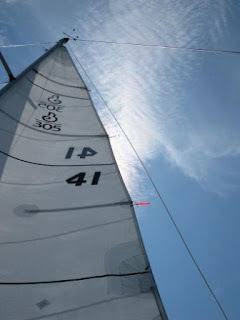 About 1pm the wind picked up enough that we could raise the sails and for the next few hours we sailed along at a nice 6 knots, enjoying the sunshine and the sail. As we approached the Nova Scotia shore the wind died. We shortly grew bored of our reduced speed of only 2 knots, so, reluctantly, we started the engine. No longer needing to pay close attention to the sails, I started to spend even more time scanning the water for signs of marine life. The water is very deep off Cape George and we have seal seals, porpoises, dolphins and whales here in the past, so I was keeping a vigilant watch for telltale signs. I was rewarded. 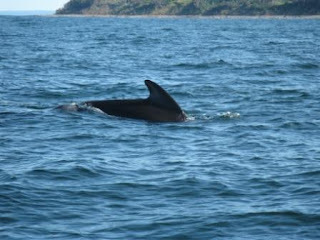 Off our port side I spotted several Atlantic White Sided dolphins who looked to be feeding. They were splashing and diving and were a little ways away, so it was tough to count exactly how many there were. But at one point I think I counted 8 different fins. We watched them as long as we could and tried to take a few photos. 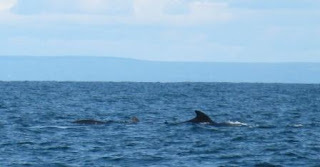 Giddy with delight at having seen them, we motored on, drawing nearer to Cape George. Suddenly we spotted more fins off our starboard side between us and the shore, which was not quite 2 NM away. As Jay scrambled once more for the camera, a pilot whale surfaced about 50 feet from the boat. I was awed by their size. Pilot whales are 20-25 feet in length and can weigh 3000kg. The whales and dolphins moved on and so did we, feeling a little awestruck. We motored around Cape George and pulled into Ballantyne's Cove about 5:30pm. As we made fast the boat, we looked at each other and grinned. Our trip had gotten off to a marvellous start. Since coming home from Summerside and Shediac, we have only managed a few day sails out into Cardigan Bay due to work commitments. Between trips, we did a couple of upgrades to Obsession. First was to install a cabin fan. On hot days, it can get quite stuffy down below, especially when we are cooking on the stove, so we put in a 6 inch cabin fan to help move the air around. Second, we upgraded the anchor chain and rode. Before, we had about 20 feet of chain and an additional 120 feet of anchor rode. Using a 7:1 scope, this only let us anchor in about 20 feet of water safely. With the new combination of 40 feet of chain and an additional 250 feet of anchor rode, we can now anchor in about 40 feet of water. This gives us much more flexibility, particularly in a location like the Bras D'Or lakes, where the bottom can drop off quite rapidly. We had encountered spots in our previous trips where, in order to get to a safe depth, we had to be uncomfortably close to shore. Now we have more options for overnight anchorages. While installing the anchor rode, we added a small piece of blue whipping every 10 feet to make it easier to determine how much scope we were letting out. Third, we fixed the piece of vinyl that was sagging in the head. Beneteau boats in the age range of Obsession have a problem with the headliner. Much of the interior of the boat is covered in a white, vinyl headliner with a thin foam backing. This is attached to the interior of the hull of the boat. The problem is that the foam can deteriorate, and then the vinyl separates and falls down. This hasn't been much of a problem for us with Obsession, with one exception. Last year, when we installed the new depth sounder and wind meter, we had to remove part of the vinyl in the head to run some wires. Once we removed the vinyl, it refused to stay reattached, although we tried more than one glue. Finally, we tried a different solution. We cut three pine boards and shaped them to fit the corners of the head where we had removed the vinyl. With a stain and a few coats of varnish, they matched the rest of the trim in the interior. We screwed them on, trapping the edges of the vinyl underneath. Now, not only does it look much better, but by removing only a couple of screws, we can get easy access to the wires that run under the vinyl in the head area.